Health Organizations. Are they Legit? Students were tasked with exploring the validity and reliability of a variety of Health-related web sites. They used the Social Bookmarking tool Diigo to review and post constructive dialogue about those web sites. 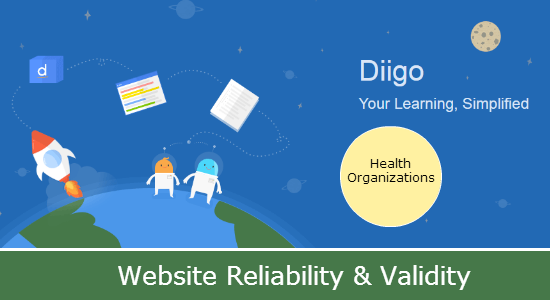 Diigo allowed for students to locate information on any laptop or mobile device and bookmark and share those sites with other group members. This provided a one stop shop for all research and allowed for group members to collaborate in order to determine the validity of each site based on the CRAAP test. Their final artifact included a display in a “Gallery Walk” of their findings, in Google Slide Presentation. Ideal: The teachers modeled effective ways to research using the CRAAP acronym to validate web sites. Students were also introduced to Easybib for citing their sources. Students used the social bookmarking site, Diigo, for discovering and saving information with group members. The teachers provided one site for each group and each group explored the web to find other valid Health-related site(s) that was meaningful and relevant to them and to the topic. One student explored a diabetic site due to a family member’s experience with this disease. Approaching: Students were assigned teams of 4-5 to work collaboratively in developing a Google Slide presentation for their peers to view during the final “Gallery Walk.” Appropriate digital tools were used to collaborate and share, using Diigo and Google Slides. Google Slides allowed for others outside the classroom to view their finished artifacts.